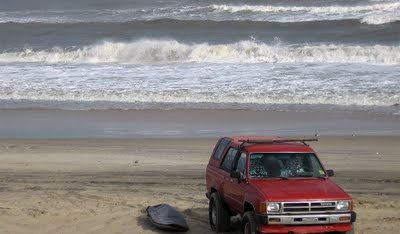 Bill's OBX Beach Life: Coqunia Beach, South Nags Head SCORES Again!! UPDATE: Photos added! Though, with the point and shoot, it does not really do it justice... I called Yana yesterday to see if she was available to come out and shoot the sesh, but received an email today that she is in Hawaii for the Eddie Aikau contest! Lucky girl!! Wow, there is something about the set up at Coqunia Beach south of Nags Head which simply works for pure wavesailing. 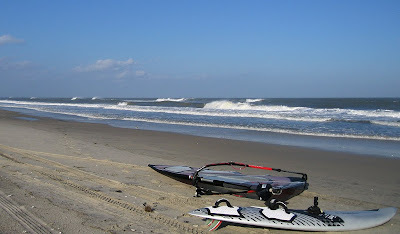 Today, the ingredients combined again to produce some of the best side-off DTL wavesailing conditions found on the OBX. 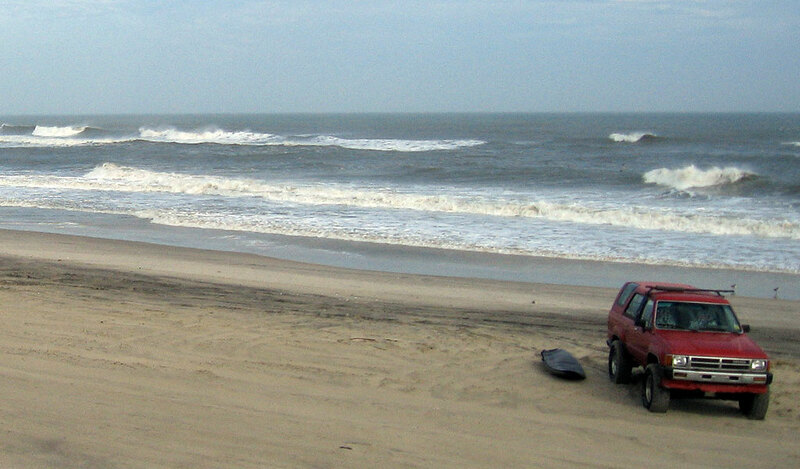 The combination of a S swell and SSW wind complemented by the land/beach orientation and outer sandbars simply make this spot epic! 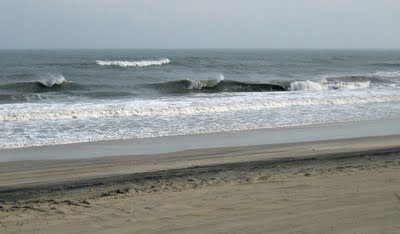 The wave at Coqunia is the closest I have experienced on the OBX to a Maui or Punta San Carlos setup. 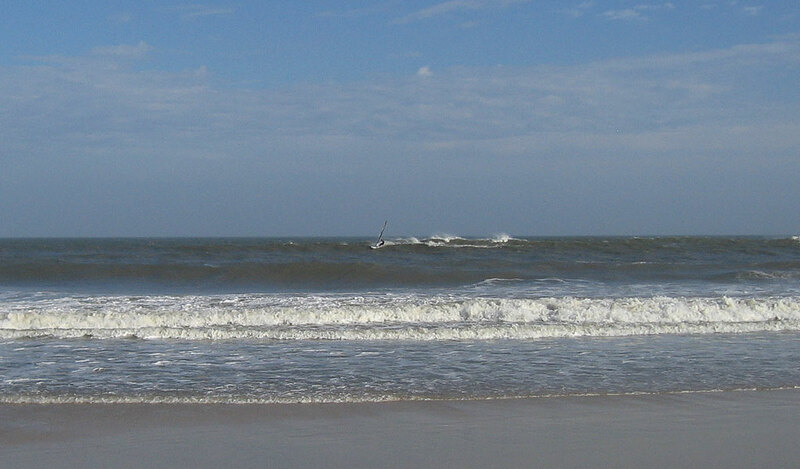 At Coquina, a long line, crumbly, yet powerful wave breaking on an outer bar, with a takeoff over 100 yards offshore is hard to beat. The Lounge is so flat and wide, it is simply perfect. No micro chop or weird currents..., simply smooth inside the wave zone. 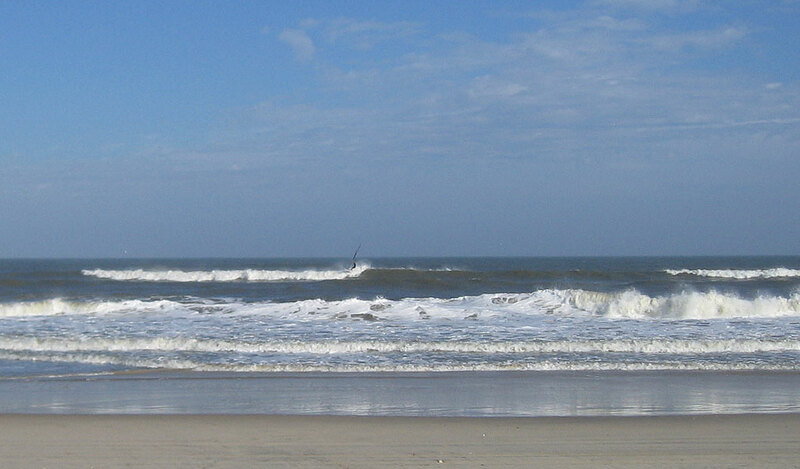 The only difficulty at Coquina can be the shorepound and beach current, but if you make it past that immediate inside section, its simply wavesailing Nirvana in the wave zone. 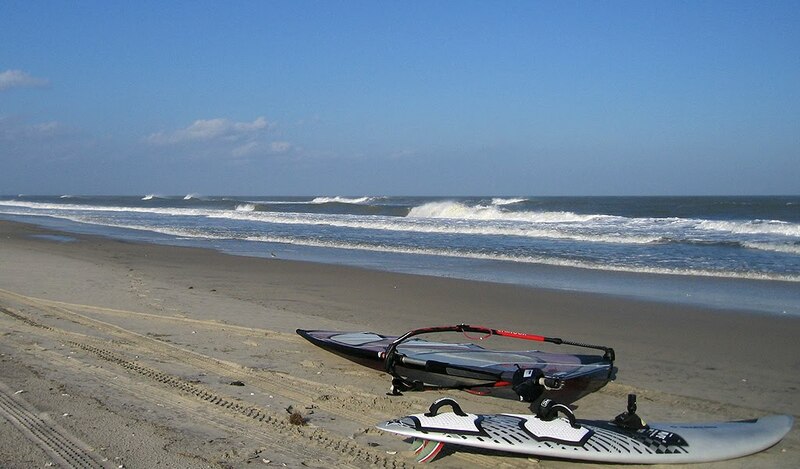 Today, everything aligned to provide some of the best pure clean DTL wavesailing the OBX has to offer. 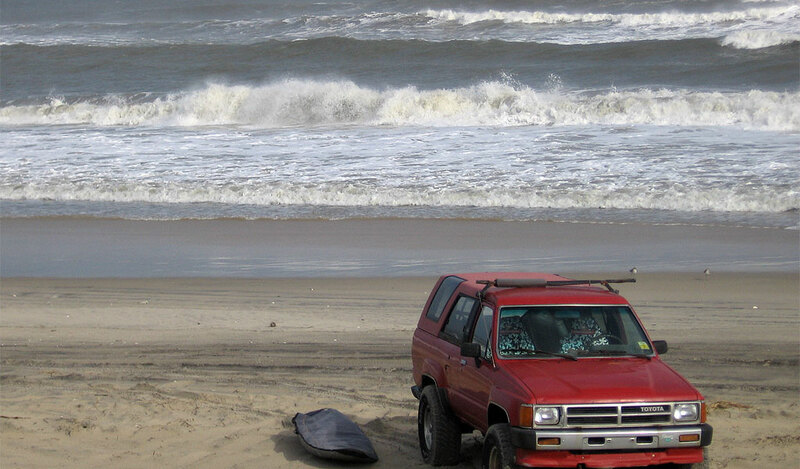 Interestingly, Coquina is not on the main list of premier OBX wavesailing spots, but this year, I have discovered that it simply is one of the best, if not the best, on the islands. Those who experienced the perfection of the Hurricane Bill swell back in August at Coquina, along with experiences similar to what I had today, simply make this spot awesome! I was quite bummed that I was solo out there today because there were too many epic waves not ridden, though it was cool that Caleb did catch some pics with my point and shoot. Too bad though that is does not really capture the experience. 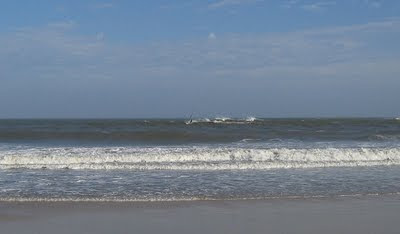 Coquina is definately a great spot, as Janis and i discovered on our wave home from wavejam this past september. and yup, i remember the shore pound too. ps. yesterday Assateague was firing, and its just been an unreal few weeks. Cant wait to see these pictures. Great blog. Can I ask you a technical question? Where did you find your template with one sidebar each side? I dont see anyone like yours in the templates offered by blogger. Thanks in advance. Glad you enjoy the blog! Regarding the template, I custom created it based upon a stock two column blogger template. I simply used an HTML table with two cells, one for the left column, and the second containing the body of the original blogger template. Add in some css styling tweaks, and alignment corrections, and wala, a three column Blogger template. man that does look epic. caleb must of been going out of his mind not being able to get out there. sweet man. how's that tempo? Ah, the Tempo is awesome!! Especially, in the light air side-off wavesailing recently!